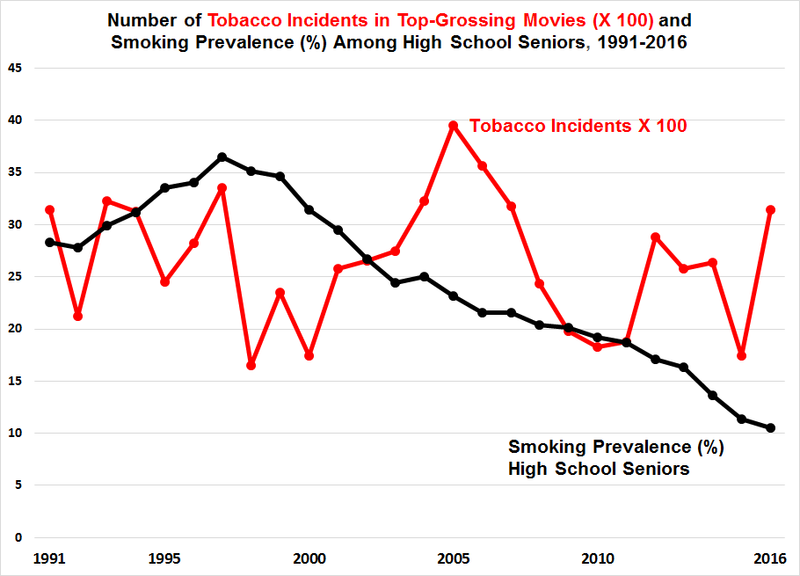 Responding, Guy Bentley published an excellent commentary noting that any connection between smoking in movies and among teens is illusory (here). I provide statistical evidence of this by analyzing the CDC report’s numbers together with smoking prevalence rates among high school seniors for the same years. The resulting chart fails to support any of the above claims. 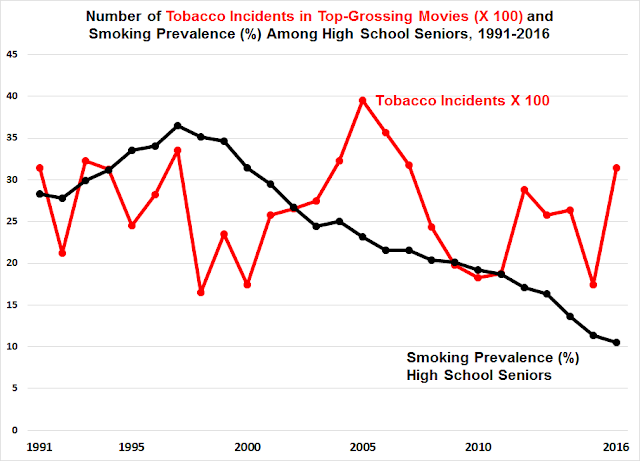 The number of tobacco incidents per year in top-grossing movies varied from 1,600 to 3,300 over 25 years, 1991-2016, except for a couple years around 2005. Smoking among high school seniors plummeted continuously after 1996. There appears to be no connection between the two data sets. The report clearly lacks objectivity. It was authored by CDC staffer Michael Tynan; Jonathan Polansky, founder of the advocacy firm Onbeyond and creator of the Smokefree Movies campaign (here); Kori Titus and Renata Atayeva from Breathe California Sacramento Region (here), an organization that “…has been fighting for…tobacco-free communities [otherwise known as prohibition] since 1917…”; and Stanton Glantz, faculty member of the University of California, San Francisco, and long-time tobacco opponent. Polansky, Titus and Glantz acknowledge grant support from the Truth Initiative as their only conflict of interest. Note that the tobacco incident numbers were collected by “Youth volunteers between the ages of 14-22… trained to analyze tobacco content in films…Their data is posted weekly on our sister website SceneSmoking.org and is used by university-level researchers and public health professionals across the globe….” This underlying data does not appear to be publicly available. The link to SceneSmoking was not functional and redirected to Breathe California Sacramento. An August 17 commentary in the New England Journal of Medicine (here) by FDA Commissioner Scott Gottlieb and Center for Tobacco Products Director Mitchell Zeller raises some concern about the agency’s new tobacco regulation strategy. The piece touches on “less harmful tobacco products,” which Commissioner Gottlieb wrote favorably about earlier (here), but it includes descriptors – “potential” (four times) and “conceivable” (once) – that suggest the authors are not convinced that e-cigarettes are truly lower-risk. Smokeless tobacco, already demonstrated to be vastly safer than cigarettes, isn’t mentioned. In their commentary, the FDA officials advocate for radical nicotine reduction (RNR) in cigarettes. RNR is a variation on a failed concept: supply-side elimination of popular products. Full-on cigarette prohibition was adopted, then jettisoned, in 12 states from 1899 to 1909 (here). During Prohibition a decade later, brewers tried to market an alcohol-free product called near beer (here). That bombed just as badly as Vector Group’s RNR cigarettes in 2003 (here). Any new RNR products will likely be rejected as well, causing smokers to seek out higher-nicotine-level products, licit or otherwise. Despite a significant expenditure of taxpayer dollars on RNR research, this approach has not been demonstrated to reduce adult smoking. For example, a $29 million clinical trial by Dr. Neal Benowitz, reported in 2015, produced dismal results (my review here). The FDA commissioner and his co-author remain optimistic: “A recent 6-week study by Donny et al. showed that cigarettes with lower nicotine content reduced nicotine exposure and dependence, as well as the number of cigarettes smoked, as compared with cigarettes with standard nicotine levels.” They are referring to another 2015 report (here), but that study’s results were unimpressive as well. Dr. Eric Donny recruited 840 smokers uninterested in quitting, and randomly provided them with one of seven types of cigarettes to use for 6 weeks: their usual brand, a full-nicotine study cigarette and five others with varying low nicotine levels (2% to 33% of the full-nicotine cigarette). Subjects were paid up to $835 for 10 clinic visits, which probably contributed to a 92% completion rate. While it was not surprising that smokers using reduced nicotine cigarettes had lower nicotine levels in their urine, most of the low-nicotine smokers (73-81%) admitted that they smoked three or four “wildcat” cigarettes (products not distributed as part of the study) on 24-35% of days in the trial. There was little consistency regarding changes in dependence. On the Wisconsin scale, smokers in all groups had lower scores after six weeks than at baseline, with only one of the reduced nicotine groups significantly lower than the full-nicotine group. On the Fagerström scale, three low-nicotine groups were significantly lower than the full-nicotine group, but the changes from baseline were not impressive. In other words, it is not clear if the low-nicotine cigarettes reduced dependence. The number of cigarettes smoked in the Donny study is interesting. At baseline, every group was smoking about 15 cigarettes per day. Although Commissioner Gottlieb and Mr. Zeller imply that low-nicotine groups smoked fewer cigarettes at the end of the study, they actually averaged 15-16 cigarettes per day. Smokers of usual-brand and full-nicotine cigarettes smoked 21-22 per day after six weeks, an increase of 6-7. Perhaps Donny contributed to this increased consumption by providing full nicotine cigarettes for free. Like the Benowitz study, the Donny study does not prove that reduced-nicotine cigarettes produce meaningful benefits for smokers. It should be noted that the Donny study was supported by $93.3 million in grants from the National Institute on Drug Abuse and the FDA. The American Journal of Epidemiology in October 2016 published a report by Annah Wyss of the National Institute of Environment Health Science and 20 government-funded coauthors. It revealed that American men had ZERO mouth cancers associated with dipping or chewing tobacco (Odds Ratio, OR = 0.9), while women, who mainly use powdered dry snuff, had a 9-fold elevated risk (here). After trying for several months to correspond with the authors, I wrote to the journal editor. My letter was accepted, and the authors were invited to reply. The journal published both items on August 4 (here). Here is my letter. Because the references are important, I provide links to the sources. “In the article… Wyss et al. omit key information that would likely yield critical insights about their most important result. “Wyss et al. reported that ever use of snuff among never cigarette smokers was associated with head and neck cancer (OR = 1.71, [95% Confidence Interval] CI: 1.08, 2.70), based on 44 exposed cases and 62 exposed controls. The OR among women ever snuff users (8.89, CI: 3.59, 22.0, based on 20 exposed cases and 12 controls) was an order of magnitude higher than that in men (0.86, CI: 0.49, 1.51, based on 24 exposed cases and 50 controls). “The striking difference between women and men reflects completely different snuff exposures. It is widely known that in the southern U.S. women primarily use powdered dry snuff, whereas men throughout the U.S. use moist snuff. Powdered dry snuff use is associated with excess oral cancer risk in four previous studies (Reference 2), all of which were cited by Wyss (3, 4, 5, 6). In contrast, moist snuff is associated with minimal to no risk in eight previous studies (2). “Wyss and colleagues are knowledgeable about the use of powdered dry snuff by women and its cancer risk; one was first author of a 1981 study reporting that “[t]he relative risk [for oral and pharyngeal cancer] associated with snuff dipping among white [women] nonsmokers [in North Carolina] was 4.2 (95 per cent confidence limits, 2.6 to 6.7).” (4) Subjects in that study had exclusively used powdered dry snuff. “Wyss et al. used pooled data from 11 US case-control studies located throughout the U.S. 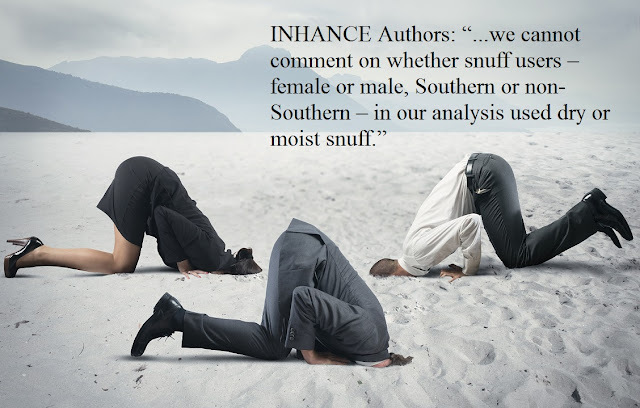 They have information to confirm that the 20 female [powdered dry] snuff users with cancer were from study sites in the Southern U.S., whereas the 24 male [moist] snuff users were from more diverse locations. This information is not available from the 12 publications cited by Wyss et al. as data sources. Six publications had insufficient information about exposed and unexposed cases and controls (i.e. no specificity with respect to smokeless tobacco type, gender, and/or smoking), three reported no results related to any smokeless tobacco product and three did not mention smokeless tobacco at all. In Southern women, the risk was quite high (OR = 11.25) and statistically significant, but with a wide 95% confidence interval (2.14 – 59.07), owing to the fact that the OR was based on only 26 cases. In non-Southern women, the OR was even higher, at 15.91, but this was based on a mere 6 cases. While statistically significant from a technical perspective (CI = 1.20 – 211.43), the CI is so large and unstable that the estimate is virtually meaningless. To be clear, numerous studies since 1981 have demonstrated that the huge difference in mouth cancer risk between women and men is attributable to powdered dry and moist snuff. Yet federally funded researchers continue to misrepresent these established facts in order to sustain the fiction that all smokeless products are hazardous.